Happy 2016 all! Hope you had a wonderful holiday and are jumping two feet in to 2016. I have lots of goals for Keep It Beautiful Designs this year and hope that you will join me on the journey. To start the year, I thought I would FINALLY show you a quick project that I didn't get a chance to show you last year. I know the new year is about starting fresh but I did promise to share it with you and it's got a few easy tips that I thought you might want to hear. 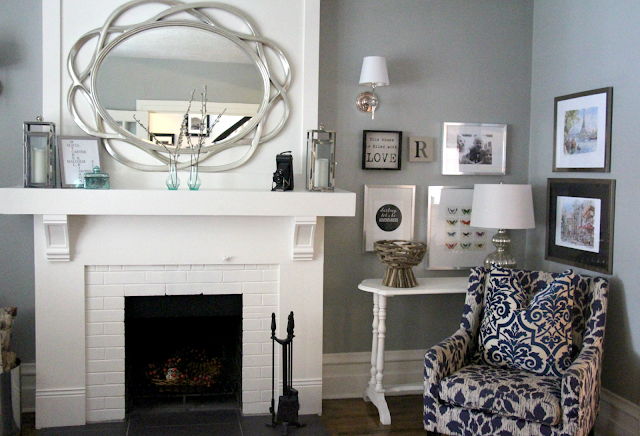 It’s a little gallery wall in the living room. I have left the walls on either side of the fireplace blank for so long, in the search of two fabulous paintings. My original idea was to find two pieces of art that were similar in colours but different paintings. However, I just couldn’t find the right one for the space. 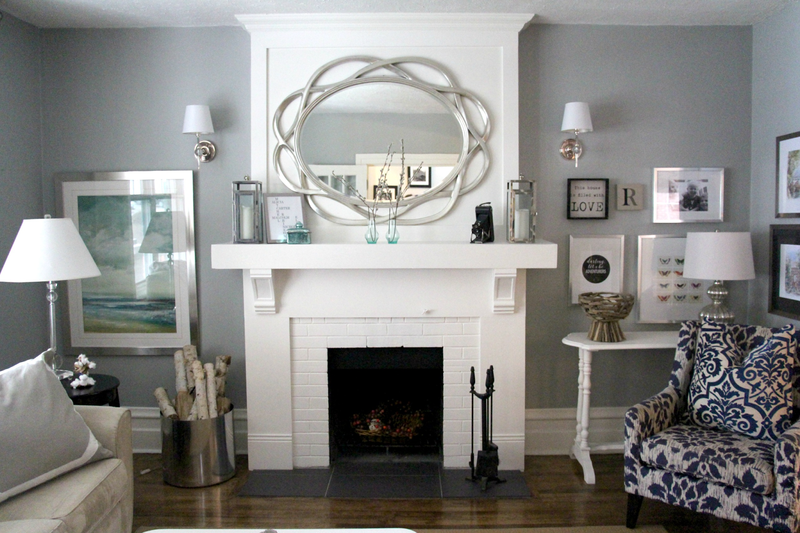 Then, while sitting in my girlfriend Lisa’s house one night I was admiring the four square prints she had flanking one side of the mantle. Inspired by this, I decided that a mini gallery wall would be the answer to the empty space. Where to start? 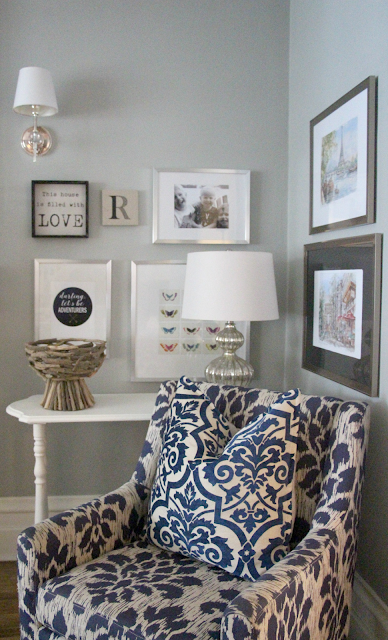 If you’re thinking of doing a gallery wall, look for the first piece that you most definitely want on it. While in the check-out line at Homesense, a cute little “This is house if filled with love” box was my inspiration. I knew that I wanted it on the wall. Next stop…Ikea. The boys bounced around in the balls while I got to browse by myself. Trying to move around Ikea with little kids is like herding cats. I hit the frame section and placed a few different sizes on the floor to map out a “look”. So now I had a few frames that needed something. My girlfriend Gemma is a fellow blogger (check out her fab blog!) in Ottawa and sells adorable prints. I picked up the "darling let's be adventurers" print. Now to hang. 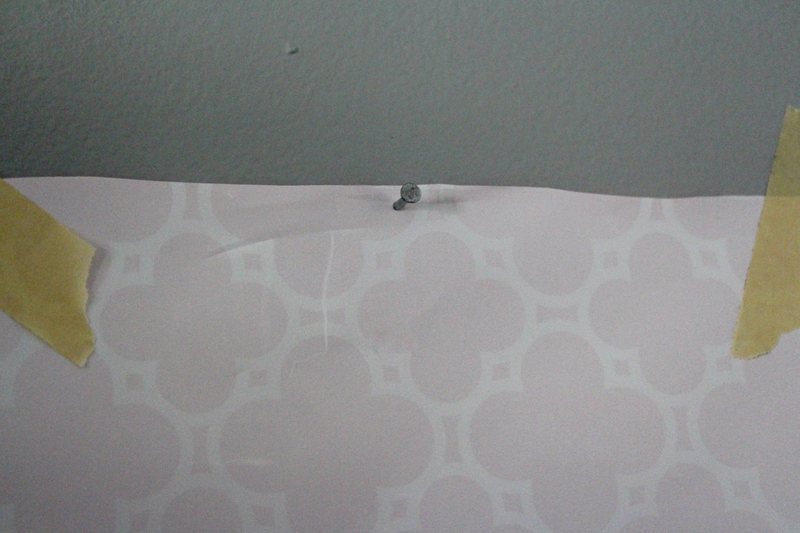 Hanging pictures can be one.of.the.most.frustrating things in life. Honestly, it can be brutal. I totally get it and trying to do it with a partner can be even more "pull your hair out". 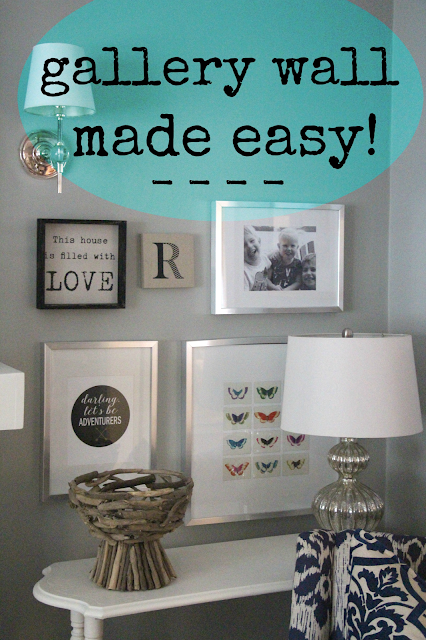 So, here are a few tips that made hanging this gallery wall a piece of cake and very easy. Promise. 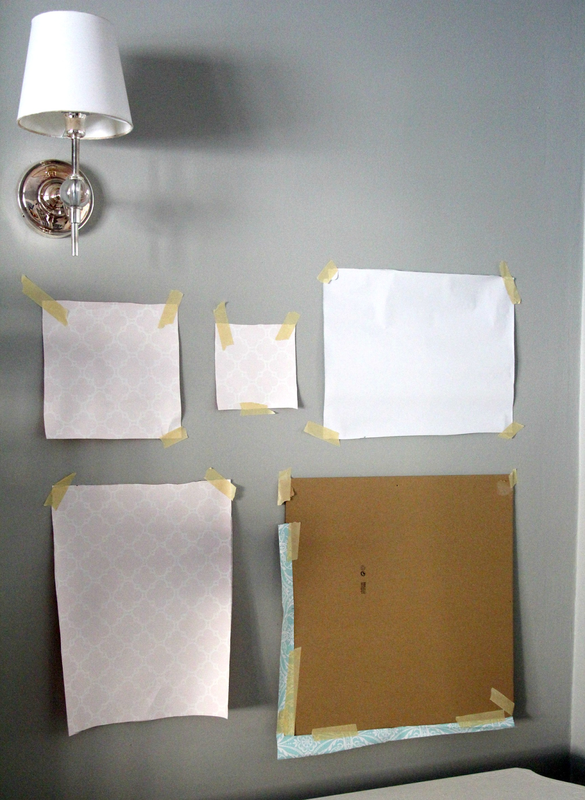 Tip #1: After laying your frames out on the floor and deciding on the positing, trace the frames on carboard, kraft paper etc. I used wrapping paper. Cut out the shapes. They don't have to be perfect lines, just close.Tape them to the wall. It's not pretty but just go with it. Try to keep your spacing between the frames relatively even (no need to measure). This will keep your wall looking cohesive and not messy. Move them around until you get the perfect ensemble. 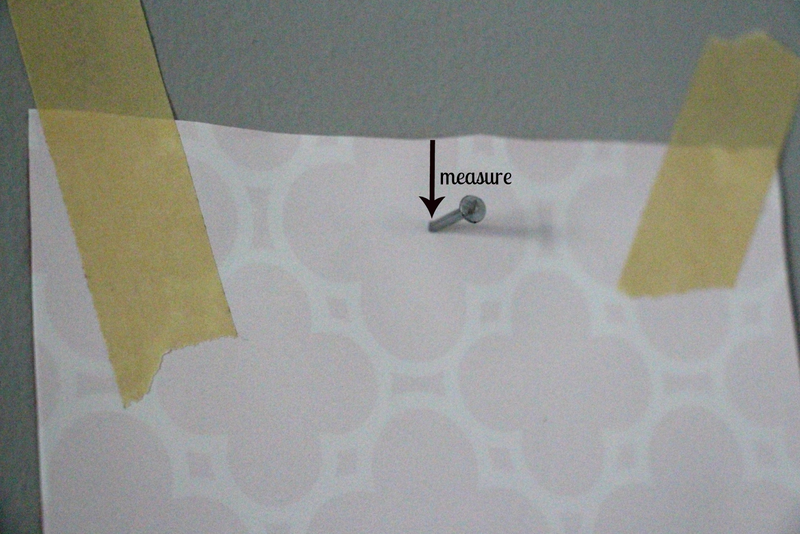 Tip #2: Holding your frame, measure the distance between the top of the frame and where the nail needs to go. If you are using different frames, the spacing might be different. Usually, on the Ikea Ribba frames it's about an inch. Estimate the centre (or measure, I'm too impatient) and nail the hole directly through the wrapping paper, into the wall. Tip #3: Tear off the paper and voila, your nail is in the perfect spot. Easy peasy. No secretly wanting to throw a hammer at your partner for hanging them crooked ;) Just place your frames on and voila! A photo of our cutie pies fit in the last frame and our living room wall has gone from empty to filled with love. We had the painting on the other side of the mantle, in the breakfast room but now it has a new home. Actually, it did have a new home until yesterday. I had taken it down for a Christmas painting we had and when I went to put it back up yesterday, I dropped it and the glass smashed. Ugh. I really love it so I'm going to try to have a piece of glass cut. Fingers crossed! One final tip! Have you noticed that the Ikea frame mats are off white? It's always annoyed me because I need it to be pure white to match all the other white in the house. Here's something awesome. Just flip them over. On the other side, they are perfectly white. Yes! Gallery walls are trendy. Some say, trending out. I say, they’re here to stay for awhile, at least for 2016. Who doesn’t love a wall of gorgeous photos? Who doesn’t love a wall of your favourite things? I say go for it. I would love to see your gallery walls. Please share and I’ll share your work here. Keep it Beautiful. Happy New Year! I'm coming for you 2016. I struggle with picture placement and have always wanted a picture wall. Your idea with the nail is awesome! Also turn the matt over? omg...what a great tip. I will be turning several of mine over today. Thanks!! Need a Fabulous Rug? Mohawk Rug Giveaway!